This small urban park has a playground, picnic tables, and a gazebo. The park itself is a corner lot, it is pretty small. 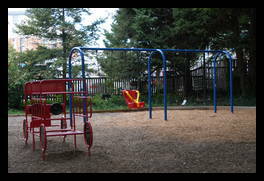 The playground is small, with a jungle gym, a teeter-totter, some swings and a metal pipe fire truck to climb on. The play area is partially shaded. 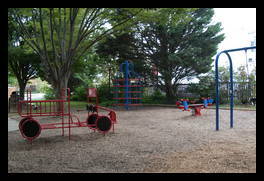 Just one block away is another small park Cheltenham Park that is really the 'other half' of this park, the play area there has slides and other things that are missing from this park. There is a picnic table as well as several benches. 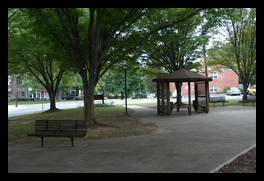 The gazebo also has benches along the inside. 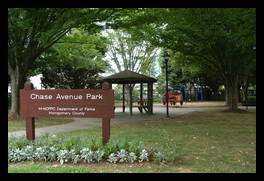 The park is pretty well shaded by trees, so not much grass is around. There isn't any parking available. Shade yes good Almost the whole park is shaded by trees.